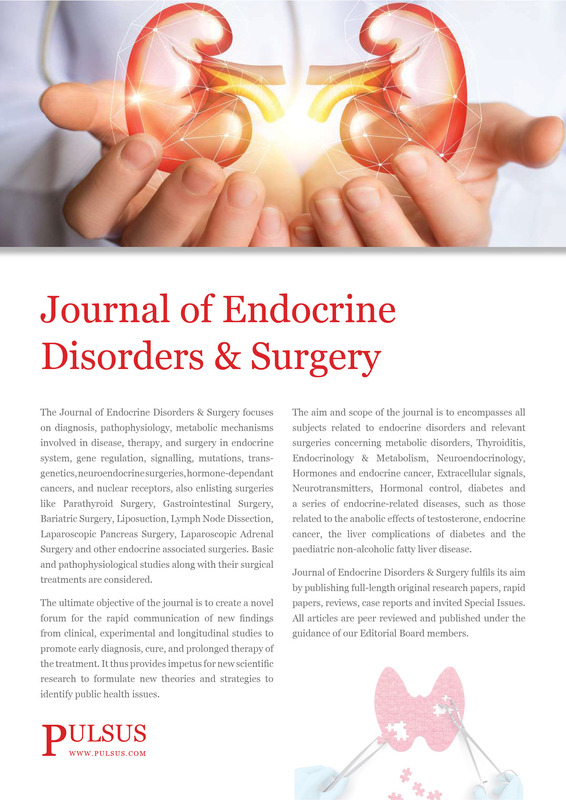 The Journal of Endocrine Disorders & Surgery focuses on diagnosis, pathophysiology, metabolic mechanisms involved in disease, therapy, and surgery in endocrine system, gene regulation, signalling, mutations, trans-genetics, neuroendocrine surgeries, hormone-dependant cancers, and nuclear receptors, also enlisting surgeries like Parathyroid Surgery, Gastrointestinal Surgery, Bariatric Surgery, Liposuction, Lymph Node Dissection, Laparoscopic Pancreas Surgery, Laparoscopic Adrenal Surgery and other endocrine associated surgeries. Basic and pathophysiological studies along with their surgical treatments are considered. The ultimate objective of the journal is to create a novel forum for the rapid communication of new findings from clinical, experimental and longitudinal studies to promote early diagnosis, cure, and prolonged therapy of the treatment. It thus provides impetus for new scientific research to formulate new theories and strategies to identify public health issues. The aim and scope of the journal is to encompasses all subjects related to endocrine disorders and relevant surgeries concerning metabolic disorders, Thyroiditis, Endocrinology & Metabolism, Neuroendocrinology, Hormones and endocrine cancer, Extracellular signals, Neurotransmitters, Hormonal control, diabetes and a series of endocrine-related diseases, such as those related to the anabolic effects of testosterone, endocrine cancer, the liver complications of diabetes and the paediatric non-alcoholic fatty liver disease. Journal of Endocrine Disorders & Surgery fulfils its aim by publishing full-length original research papers, rapid papers, reviews, case reports and invited Special Issues. All articles are peer reviewed and published under the guidance of our Editorial Board members. Journal of Endocrine Disorders & Surgery is an open access journal thus author gets benefits, such as free PDFs, full text, a liberal copyright policy, and much more.